Professor M G Lequesne, 31–33 rue Guilleminot, 75014, Paris, France. OBJECTIVE The technique and results of a special oblique radiograph of the hip called the “faux profil” (FP) of the hip are described. The FP was evaluated for the detection of joint space narrowing in incipient osteoarthritis of the hip (OAH) as compared with the anteroposterior (AP) radiograph. METHODS 58 hips with incipient osteoarthritis (joint space narrowing, 0–25% on the AP view) in 48 patients were identified among 200 consecutive patients fulfilling American College of Rheumatology criteria for OAH. Joint space narrowing was measured on the AP and FP radiographs of these 58 hips. RESULTS The FP view provides a true lateral projection of the femoral head and neck, and an oblique view of the acetabulum tangential to its superoanteromedial edge. On this view, the width of the anterosuperior and posteroinferior parts of the joint space can be measured and compared. Among the 58 hips with incipient OAH, 36 (62%) showed joint space narrowing on the AP view and 51 (91%) on the FP view. Among the 22 hips without joint space narrowing on the AP radiograph, 16 (72.7%) showed joint space narrowing on the FP view, involving the anterosuperior part of the joint in 11 cases and the posteroinferior part in five cases. CONCLUSION The FP view in the standing position should be used in incipient OAH as a complement to the AP view in patients with suspected OAH but no joint space narrowing on the AP radiograph. In this situation, nearly three quarters of hips in the study had joint space narrowing on the FP view, usually in the anterosuperior part and less often in the posteroinferior part of the joint. Classic lateral radiographic views of the hip, including the frog-leg view, the anteroposterior view with the hip abducted,1 the groin lateral projection (Magilligan2), and the Dunlap view3, are taken with the patient in the supine position. However, joint space narrowing (JSN) of the femorotibial and hip joints may be underestimated on radiographs taken in the supine as compared with the standing position4 because the cartilage softening caused by degenerative joint disease results in a small but significant increase in joint space width in the absence of joint loading. Although both OAH and developmental dysplasia of the hip are indications for the FP view, only the former is discussed here. JSN, an important feature of OAH, is sometimes absent on the anteroposterior (AP) radiograph. We conducted this study to determine the proportion of cases of incipient OAH in which unequivocal JSN is seen only on the FP view. The radiographic table is vertical. The cassette is inserted in the table rack. Ideally, fluoroscopy is used to ensure that the projection is correct, although experienced technicians can obtain correct FP views without fluoroscopy. The patient first stands sidewise with the hip to be studied in contact with the radiographic table. The axis of the ipsilateral foot (second metatarsal bone) is parallel to the radiographic table and must remain in this position during the subsequent phase to obtain a true lateral view of the proximal end of the femur (fig 1A). The pelvis is then rotated 25° backwards (fig 1B, C) to profile the anterosuperomedial edge of the acetabulum. The back of the patient is at a 65° angle with the radiographic table. A wedge may be placed between the patient’s back at the level of the superior border of the sacrum and the radiographic table (fig 1B, C) to check that positioning is correct. Diagram of the patient’s position. (A) Position of the patient for an FP radiograph of the right hip. Axis of the foot (2nd metatarsus) should be parallel to the radiographic table. (B) For the left hip. (C) Cross sectional diagram of the pelvis showing: (a) the 25° angle between the anterior edge of the acetabulum and the coronal plane; (b) the position of the pelvis, rotated 25° backward around a vertical axis to align the superoanteromedial edge of the targeted acetabulum with the x ray beam; (c) the position of the lower limb with the axis of the foot parallel to the film so as to obtain a true lateral view of the proximal third of the femur. The x ray beam is centred on the medial part of the contralateral groin. If fluoroscopy control is used, the xray beam is centred between the two femoral heads. The focus-film distance is 110 cm. Correct positioning is checked using the following criteria (fig 2A, B): the anterosuperior part of the pubis projects near the anterior edge of the greater trochanter; the distance between the two femoral heads is between two and three thirds of the diameter of the targeted femoral head; the centre of the femoral head, the axis of the femoral neck, and the axis of the femoral shaft are approximately on the same vertical line; the lesser trochanter is slightly prominent posteriorly, which indicates neutral rotation of the lower limb; the posterior margin of the greater trochanter projects just behind the posterior edge of the femoral neck. Normal findings on the FP view. Radiograph and diagram. (1) Anteromedial edge of the acetabulum; (2) The superior part of the acetabulum appears as a sclerotic curved line ending at point A, which is the anterior extremity of the acetabular roof. The posterior part of the acetabulum (that is, the posterior extension of the above mentioned superior sclerotic line) ends inferiorly at the posteroinferior rim—that is, at the acetabular horn (3). The distance between the two femoral heads (4 and 4 bis) is two to three thirds of the diameter of the ipsilateral femoral head. The femoral neck (5) is visible through the greater trochanter. The posterior (6) and the superior edges (7) of the greater trochanter are well delineated. The lesser trochanter (8) appears as a small prominence posterior to the inferior part of the greater trochanter. The ischiopubic ramus joining the ischial tuberosity (9) to the pubic bone (10) is partly superimposed on the proximal femur. The anterosuperior part of the pubic bone (10) is superimposed on the anterior margin of the greater trochanter. Conversely, the following criteria are indicative of inaccurate positioning: a between heads distance of more than three thirds of the diameter of the ipsilateral femoral head indicates a position that is too close to a true 45° oblique view; a between heads distance of less than two thirds of the diameter of the ipsilateral femoral head indicates a position too close to a true lateral view; exaggerated prominence of the lesser trochanter indicates internal rotation of the lower limb; absent or minimal prominence of the lesser trochanter indicates external rotation of the leg. The AP radiographs of 200 consecutive patients (118 female and 82 male with a mean age of 62.2 years; range 37.5–78) meeting classification tree 2 of the American College of Rheumatology (ACR) criteria for painful OAH—that is, chronic pain and at least osteophytosis12—were reviewed to select those with incipient OAH. The latter was defined as presence on the AP view of osteophytosis and mild (⩽25%), doubtful, or absent JSN. An FP view of every incipient OA hip was obtained. Joint space measurement (chondrometry) was performed using calipers and a ruler graduated in half millimetres, as described previously.13 JSN was evaluated by comparison with the healthy side. Cases with bilateral OAH were included when they fulfilled one of the three following criteria: decreased joint space as compared with an earlier radiograph, if available; joint space width on the AP view of 3 mm or less, a threshold used in previous studies14 15; mild JSN compared with the contralateral hip when the latter exhibited osteophytosis without JSN. In cases with probable JSN difficult to assess because of the lack of a possible comparison, the JSN was classified as “doubtful”. The FP view provides a true lateral view of the proximal end of the femur, and also profiles the anterosuperomedial edge of the acetabulum as a cortical line crossing the femoral head projection almost vertically. Figure 2 shows the main landmarks of the normal hip in FP view. In the normal hip, JS width is greater at the anterosuperior than at the posterior part of the joint (figs 2 and 6). FP view during arthrography. Normal hip.The anterosuperior part of the JS (especially the acetabular cartilage) is normally thicker (arrow) than its posterior part. Note the mild acetabular deficiency: the anterior part of the acetabular roof is too short. The axis of the femoral neck is nearly vertical in the absence of significant anteversion or retroversion (fig 2B). Forty eight of the 200 patients were found to have incipient OAH, which was bilateral in 10 patients. Among the 58 cases of incipient OAH, 36 (62%) exhibited JSN on the AP view and 51 (91%) on the FP view. JSN was apparent on the FP view in 35 of the 36 hips with a JSN on the AP radiograph. In 22 (38%) hips, JSN was doubtful or absent on the AP view (table 1(a)). In 16 (72.7%) of these 22 hips, the FP view showed definite JSN in either an anterosuperior (n=11) or a posterior or posteroinferior (n=5) location (table 1(b)). In four (18%) cases, the FP view showed doubtful JSN (anterosuperior, n=1; posteroinferior, n=3). Figures 3, 4, 5 show examples of anterosuperior JSN visible only on the FP view. Special care was taken to identification of a widening of the posteroinferior part of the joint space (fig 3B, 4B), an abnormality that indicates anterosuperior subluxation of the femoral head. As mentioned above, the JS on the FP view of the normal hip is widest at the anterosuperior part of the joint. It follows that an equal JS width between the anterosuperior and posteroinferior parts of the joint indicates incipient anterior subluxation of the femoral head caused by anterosuperior JSN (fig 4B). In hips with posteroinferior JS widening, JS measurement (chondrometry) consistently demonstrated anterosuperior JSN compared with the contralateral hip. In addition, the FP view helped to localise subchondral bone cysts associated with OAH (fig 4B). Anteroposterior (A) and faux profil (B) views in incipient OAH. (A) In this 50 year old man with clinical OAH characterised by pain, minimal osteophytosis, and a supra-acetabular cyst, the anteroposterior view shows no JSN. JSN is visible only on the FP view (B), at the anterosuperior part of the joint (white arrow). The posterior JS is widened (black arrow). The femoral head has begun to migrate anteriorly and superiorly. Anteroposterior and FP views in incipient OAH. This 54 year old woman with painful left hip subsequently underwent total hip replacement. The pathologist confirmed the diagnosis of typical OA of the hip. (A) On the AP view, neither osteophytosis nor JSN are visible. The only abnormalities were two cysts in the acetabular roof (short arrows). This case was therefore not included in the series reported in this article because it did not meet ACR criteria.12 (B) On the FP view, the equal width of the anterosuperior and posterior portions of the JS (long arrows) already indicates anterosuperior JSN with incipient anterior subluxation of the femoral head, as the cartilage is normally thicker at the superior than at the posterior part of the joint (fig 2B and fig 6). Subchondral cysts are visible in the same location (short arrow). Arthrography performed in one of our patient exhibits the thinning of the anterosuperior part of the acetabular cartilage, visible only on the FP view (fig 5A, B). A FP view taken during arthrography of a normal, asymptomatic hip shows clearly that the thickness of the acetabular hyaline cartilage increases gradually from the posteroinferior to the anterosuperior part of the joint (fig6). Anteroposterior and faux profile views during arthrography. Incipient OA of the hip. This 58 year old woman had a one year history of pain in her left hip. (A) The AP view does not show cartilage thinning. (B) On the FP view, the width of the acetabular cartilage is markedly reduced at the anterosuperior part of the joint (arrow). The widened posterior JS is filled with contrast medium. All of the five hips with posteroinferior JSN also exhibited osteophytosis of the posterior acetabular horn, which was clearly visible on the FP view (fig 7B). (A) AP view showing only osteophytosis; (B) FP view: posteroinferior JSN (black arrow). Note also the subchondral sclerosis in the area of JSN, and the osteophytes arising from the posterior horn of the acetabulum and from the posteroinferior part of the femoral head-neck junction (white arrows). Among the 22 hips with no JSN on the AP view, the FP view demonstrated a JSN in 16 (72%). One explanation to the greater sensitivity of the FP view in detecting JSN is that the FP view permits the comparison of JS width between the superior and the inferior part of the joint, as in the normal hip, JS width is greater in the superior than in the posterior part of the joint (fig 2A, fig 6). Although in patients with hip pain, osteophytosis alone is sufficient to make a diagnosis of OAH according to ACR criteria,12presence of JSN establishes the diagnosis with greater confidence. In addition, the FP view may disclose a JSN in cases that do not fulfill ACR criteria for OA of the hip—that is, without JSN, or even osteophytosis, on the AP view. Figure 4A, B provides an example of this situation. Regarding JSN criteria on the FP view, three points deserve special mention. (1) Comparison with the contralateral hip, if healthy, is very useful in incipient OAH. (2) Differentiating normal JS width from JSN on the FP view is more difficult at the posteroinferior than at the anterosuperior part of the joint. Three of the four cases with doubtful JSN on the FP view in our study involved the posteroinferior part of the joint. In difficult cases, presence of an osteophyte arising from the posterior horn is an additional sign of OAH. (3) Reproducibility of the FP view is very good when fluoroscopy is used and has been found to be similar on the FP view as on the AP view.17Reproducibility of radiographic views is of critical importance in randomised controlled trials involving JS width measurement. In conclusion, an FP view should be obtained when OAH is suspected based on presence of osteophytosis and/or subchondral cyst(s) and/or subchondral sclerosis with absent or doubtful JSN on the AP view. JSN may be apparent only on the FP view at the anterosuperior or more rarely the posteroinferior part of the joint. In doubtful cases, comparison with the contralateral hip is useful. We suggest that both the AP and FP views should be used to evaluate the presence of JSN in OAH. We are grateful to Mrs Wolfe, MD, for reviewing the English of the manuscript. (1988) Diagnosis of bone and joint disorders. (W B Saunders, Philadelphia) . (1956) Calculation of the angle of anteversion by means of horizontal lateral roentgenography. J Bone Joint Surg 38A:1231–1246, . (1953) A new method for determination of torsion of the femur. J Bone Joint Surg 38A:289–312, . (1997) Effect of standing position on the radiographic hip joint space in osteoarthritic patients. Osteoarthritis Cartilage 5:17–22, . (1961) Le faux profil du bassin. Nouvelle incidence radiographique pour l’étude de la hanche. Son utilité dans les dysplasies et les différentes coxopathies. RevueduRhumatisme etdesMaladies Ostéo-articulaires 28:643–652, . 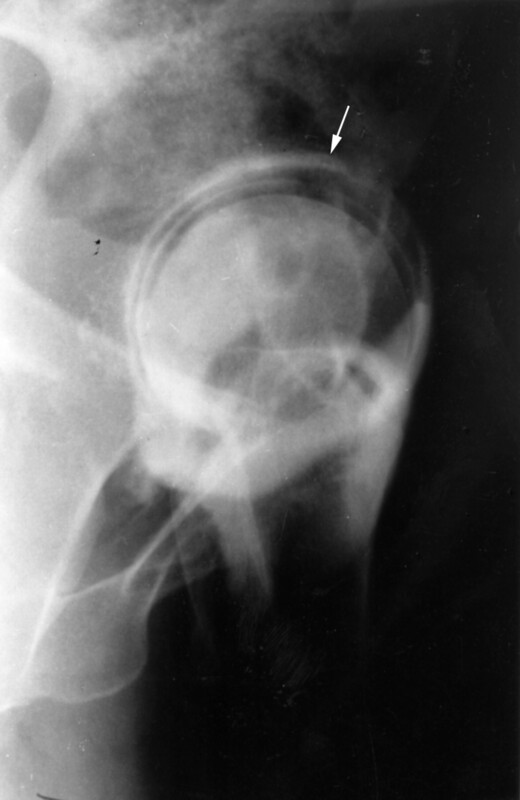 (1988) A new periacetabular osteotomy for the treatment of hip dysplasias. Clin Orthop 232:26–36, . (1995) Periacetabular and intertrochanteric osteotomy for the treatment of osteoarthritis in dysplastic hips. J Bone Joint Surg 77A:73–85, . (1978) Le plan de profil de la hanche dans les ostéotomies intertrochantériennes de varisation type Pauwels. Rev Chir Orthop 64:558–562, . Postel M. Cotyles obliques et butées associées. Rev Chir Orthop 1978;569–72..
(1995) Hip diseases. Young adults. Appropriate imaging studies and their interpretation. Can J Surg 38 (suppl 1) S6–12, . (1997) Radiographic measurements of dysplastic adults hips. Skeletal Radiol 26:75–81, . (1995) Quantitative measurements of joint space during progression of osteoarthritis: “chondrometry”. in Osteoarthritic disorders. eds Kuettner K, Goldberg V (American Academy of Orthopedic Surgeons, Rosemont), pp 427–444, . (1990) Long distance running and osteoarthrosis. Am J Sports Med 18:379–381, . (1993) Prevalence of coxarthrosis in former soccer players. 286 players compared with matched controls. Acta Orthop Scand 64:165–167, . (1981) Capsular constriction of the hip: arthrographic and clinical considerations. Skeletal Radiol 6:1–10, . (1996) Hip joint space measurement from Lequesne’s lateral view is as reproducible as from frontal radiograph. [Abstract]. Rev Rhum Engl Ed 63:747, . (1996) Design and conduct of clinical trials in patients with osteoarthritis. Osteoarthritis Cartilage 4:217–243, . and the OARS committee members. 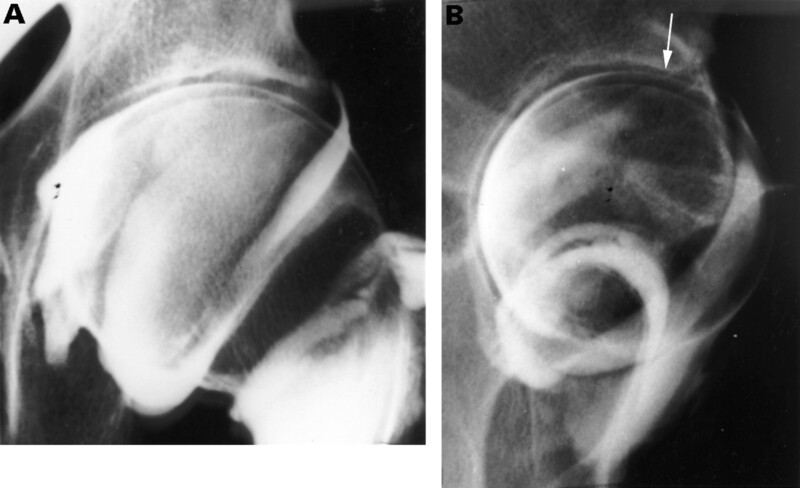 (1996) Hip lateral radiograph improves the sensitivity of joint space narrowing assessment in hip osteoarthritis (OA). [Abstract]. Rev Rhum Engl Ed 63:747, . (1997) Is decision of total hip replacement (THR) in hip osteoarthritis (OA) an outcome assessment of osteoarthritis? Arthritis Rheum 40 (suppl 9) S280, .